USB OTG (USB On The Go) is a standard that enables mobile devices to talk to one another. 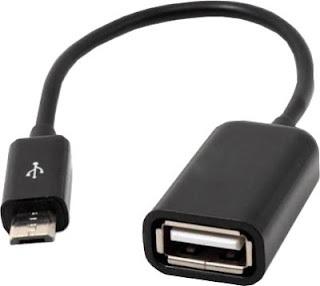 Traditionally mobile devices could only connect to a Mac/PC by USB, but USB OTG makes it possible for devices to connect directly to each other. That's not all. By enabling your device to act as a USB host, that is, to be the boss of other devices that you connect to it, you can use additional hardware such as storage, keyboards or even musical instruments together with your device. USB OTG has its own logo (see image below), which will be on your device's packaging if it's supported. If you don't have the original packaging to hand, you can use your old friend Google. However, if your smartphone was released within the last two years, you can almost guarantee it will support it. What can I do with USB OTG? By using USB OTG, it's possible to couple your smartphone or tablet with peripheral devices, such as a mouse or a keyboard, which you can then use to control it. There are some restrictions – for example, gaming mice with a billion buttons might not be fully compatible – but for the most part, the basic operations are enabled. This means it's easy to turn a tablet into a laptop by sticking an external keyboard into it. For example, you can even connect to storage devices such as USB sticks or external hard drives with USB OTG. Using a file manager on your device, you can directly access data on an external storage device and play movies or music without having to store them on your device. Alternatively, you can use it as a non-cloud based backup storage option for your photos, music, and other files from your smartphone. If you fancy making music on Android, USB OTG enables you to connect devices such as MIDI keyboards and controllers, audio inputs for instruments and vocals and various controllers that can turn your phone or tablet into a serious music-making machine. How can you use OTG on your smartphone or tablet? If your device is OTG compatible, you’ll also need a suitable OTG cable for your device. You can grab one for a few bucks from phone dealers.